AAA State of Play Blog: Play-Based Learning Sets Children Up for Academic and Personal Success! Play-Based Learning Sets Children Up for Academic and Personal Success! After a long day at school, my girls love to come home and play. They shoot hoops in the driveway, run around the playground, or find a fun activity to enjoy in our playroom. Rather than a waste of time, all this after-school playtime helps them focus better on their homework. Research also shows that play-based learning is important for child development, and it can pave the way for their academic and personal success. Let's advocate for more play in and out of school as we help our kids succeed. In most classrooms, our kids experience an academic setting. They sit at a desk, listen to the teacher, then complete worksheets, reading assignments, or other tasks. This setting is valuable for our kids' education, but besides recess, kids in academic environments receive very few opportunities to play. Play-based learning takes advantage of a child's natural curiosity, creativity, and playful attitude. In a relaxed environment, kids learn as they have fun. With games, music, art, books, activities, objects, materials, and hands-on activities, kids experiment, explore, imagine, and solve problems. 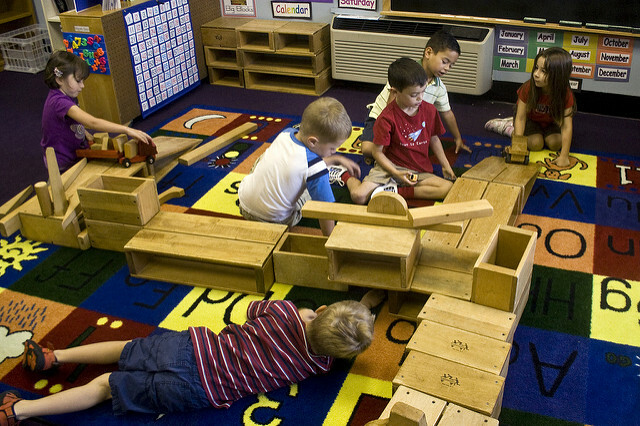 Play-based learning can occur during free play and guided play. Free Play: Kids decide which spontaneous activities they'll engage in. They use their imaginations and creativity to choose games and other play activities that may but don't have to incorporate academic topics like math, reading, and science. Guided Play: Also child-directed, guided play includes intentional guidance from the teacher. For example, the teacher may ask kids to explore a theme from the day's lesson, solve a problem, or hypothesize an outcome as they play with blocks, jump rope, or pretend they're jungle animals. Or teachers may encourage kids to work together as they play, which allows them to develop social skills such as sharing, teamwork, conflict resolution, and negotiation. You can probably tell by now that I'm a big play-based learning advocate. Part of my passion is supported by documented studies. Research results compiled by the National Association of Elementary School Principals reveal the benefits of play-based learning. Kids often spontaneously choose to include mathematical concepts as they play. A study conducted by Herb Ginsburg and Kyoung-Hye Seo found that up to half of a preschooler's playtime activities included patterns, shapes, quantities, and other math activities. Young children who use language during play experience better literacy outcomes in middle school. The connection between play and literacy is proven in a study conducted by the Home-School Study of Language and Literacy Development. Play-based learning programs improve long-term outcomes for children. The HighScope Preschool Curriculum Comparison Study (PCCS) followed children into young adulthood and found that kids who participated in play-based learning programs performed better academically and committed fewer crimes than kids who were enrolled in rigid instructional programs. Kids score higher in creativity, industry, and oral expression when they participate in play-based kindergarten classes. A study conducted in Germany followed children until age 10 and helped convince the government to implement more play-based classes. Engaging in dramatic pretend play with other kids can give children greater comprehension skills and a stronger understanding of written texts. Sara Smilansky discovered this connection as she studied young children. While play-based learning is especially important for young children, older kids also benefit. I know both of my girls appreciate opportunities to play in and out of the classroom as they learn. Here are a few ways we can add more play-based learning opportunities to our kids' academic experiences. Provide access to a variety of objects and materials. Incorporate playful, hands-on exercises in the classroom. Give children opportunities to move around during class. Provide kids with time to unwind and enjoy free play after school. Our children need play time: It's important for their academic and personal success. Let's encourage our schools to provide additional play opportunities during the day, and let's give our kids time to play at home after school. In what ways do you provide play-based learning opportunities for your kids?